It's supposed to help employees build plans -- no project management expertise needed. Microsoft has taken a big step toward helping employees stay on track with the launch of a new app called Planner. It's a Web-based tool for Office 365 subscribers designed to let them easily lay out plans for projects and business objectives and then share them with other people. After creating a plan, users can create and assign tasks, share files and update their colleagues on the status of key to-dos. Planner appears to be a response to the likes of Trello and Asana -- startups that have built their businesses on making it easier for other companies to improve their employees' productivity. Microsoft has positioned Office 365 as a key part of a users' productivity workflow, and this app is supposed to make it easier for them to stay on track and effectively collaborate with colleagues. Microsoft is no stranger to the work-planning world. The company also makes Microsoft Project, an app that's aimed at helping project managers build plans. That app is more tailored for people whose entire job is project management, rather than Planner, which is supposed to help even non-experts build plans. Dynamic Events CEO Alison Magyar, whose company used Planner in beta, said that the app was an easier-to -use version of Project. Her company has been using Planner for a variety of different purposes, including coordinating plans for events and also getting employees to create plans for what they’re doing at the company overall. The launch of Planner is in line with other Microsoft products that are aimed at taking complex business productivity tools and turning them into apps and services that are more easily used by ordinary folks. Case in point: the company has also been pushing Power BI, a data visualization and business intelligence tool that makes it easier for people who aren’t data analysts to slice and dice company data. There’s also PowerApps, a citizen development tool that’s supposed to make it possible for non-developers to build simple applications that make business data more accessible to others in their line of business. 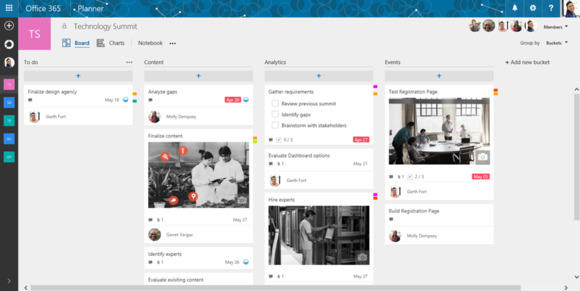 Microsoft said that Planner will be rolling out to all Office 365 tenants over the coming weeks. Users will find it in the app launcher online when it’s available for their organization.